The three-time Wimbledon winner claims his appointment as a diplomat by the Central African Republic (CAR) affords him protection from any legal claims. Mr Becker's defence has been lodged in the High Court. His lawyers maintain he cannot be made subject to any legal process unless CAR President Faustin-Archange Touadera specifically lifts his immunity at the request of the British government. His legal team said: "This means he cannot be subject to legal process in the courts of any country for so long as he remains a recognised diplomatic agent." Should diplomats still have immunity? 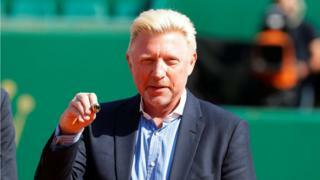 The former tennis champion said the proceedings were "unjustified and unjust" and being declared bankrupt "inflicted a whole heap of damage on me". He said he was asserting diplomatic immunity to "bring this farce to an end" and stop "the gravy train for the suits". Mr Becker added: "I am immensely proud of my appointment [by] the Central African Republic... sport is incredibly important in Africa and is fast becoming a universal language." His photo appears on the website of the CAR's embassy in Brussels, and a caption describes him as its attache for sport, culture and humanitarian affairs. But BBC diplomatic correspondent Paul Adams said in the CAR there appeared to be confusion over Mr Becker's role and a government official said he had not been not aware the post existed. An Indian and a Kazakh businessman, as well as a former adviser to the late Libyan leader Muammar Gaddafi, have all at various times attempted to avoid legal action in Europe by citing diplomatic immunity from the CAR. At the time, he said: "This order relates to one disputed loan which I was due to repay in full in one month's time." But the registrar said Mr Becker gave the impression of "a man with his head in the sand". He has appointed Ben Emmerson QC, who has previously represented Julian Assange and Marina Litvinenko, the widow of Alexander Litvinenko. CAR presidential spokesman Albert Yaloke Mokpeme told BBC Afrique the proceedings brought against Mr Becker had nothing to do with the CAR. The trustees handling Mr Becker's bankruptcy confirmed they had applied on 31 May for the status to continue because they did not consider he had "adequately complied" with his obligations. They said they had been working to ascertain the size of the estate and identify assets since 2017. In a statement, estate trustee Mark Ford from accountants Smith & Williamson said they did not believe Mr Becker's appointment as a CAR attache had a "material impact" on his bankruptcy. Under the 1961 Vienna Convention diplomats are - in theory - immune from prosecution in their host country. The immunity is not just about criminal prosecution but also civil proceedings. According to the convention: "A diplomatic agent shall enjoy immunity from the criminal jurisdiction of the receiving State. He shall also enjoy immunity from its civil and administrative jurisdiction." The convention also says that those entitled to immunity are expected to obey the law. The Crown Prosecution Service says immunity in the UK is granted to people "who have been notified to, and accepted by, the Foreign and Commonwealth Office (FCO) as performing a diplomatic function". In the UK immunity also extends to family members of diplomats (as long as they're not UK nationals). According to the Foreign Office, around 22,500 people are currently entitled to diplomatic immunity in the UK. This includes foreign embassy staff, their families as well as international organisations - such as the UN. In general, if a diplomat is suspected of committing a criminal offence in the UK, the FCO says it will ask the relevant foreign government to "waive diplomatic immunity where appropriate".